Holidays and baking are two words that have been inseparable since our Townsend, TN Bed and Breakfast near Gatlinburg, opened 15 years ago this Thanksgiving. 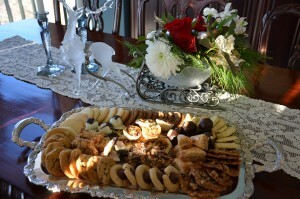 Each year, with one or two exceptions, all my Christmas gifts are goodies I have baked. Normally I complete this by Thanksgiving and deliver my tins or baskets from Thanksgiving through December. This year I was sick the latter part of November, and I didn’t finish the “selection process” until late last night. Picture me looking like Edvard Munch’s painting The Scream. As of yesterday, I considered backing off a little with the variety to give myself a break, but then I began thinking about some of the cookies from my childhood that we hadn’t baked in 30 years, and we always try a couple of new recipes. At that point I’m thinking the 12 days of (Xmas) baking, one thing a day, until I added everything up this morning and realized I had picked out 22 different recipes. On the list: one carrot cake (Louise’s finest recipe from Sweetberries B&B), blue ribbon muffins for Pete, Ginny’s mint brownies, apricot bars (which no Xmas would be complete), choc chip bars from my childhood, several loaves of apricot walnut and cranberry pecan breads, both blue ribbon winners at the Great Smoky Mountains Heritage Center’s Blue Ribbon County Fair, Jan Whitt’s toffee, my all-time favorite sweet, Cheerio mix, John Wessell’s popcorn mix called Country Cottage and 12 double batches of cookies. Cookie Tray from 2013, six great recipes, and other new recipes that didn’t make the cut to 2014! Of the cookies, six have made the list here for the last decade, two are from my childhood, (why has it been 30 years since I made almond crescents??) and four are new recipes. Of the four new ones, one is a potato chip cookie recipe from a cookbook I have. Reminded me of cookies when I was a kid. I thought maybe Great Aunt Margaret on the Janke side, but my mom just said she thought it was my Aunt Stephanie’s recipe on her side of the family. Good reason to give her a call and compare recipes! My mom was never the cookies and milk after school type of mom, but I have to give her credit, she baked up a storm before Christmas. She’d run out of tins and start filling the turkey roaster and the soup pots. Most were double and triple batches. She said she wanted at least a few of each kind to put out on Christmas when the relatives came, and that was about all that was left as we Janke kids had sticky fingers for weeks before the main event. Or maybe is was only mizkathleen who had the sticky fingers. I spent some real quality time in the dark pantries of my various childhood homes.